In computed tomography (CT), some superficial organs which have increased sensitivity to radiation, receive doses that are significant enough to be matter of concern. Therefore, in this study, the effects of using shields on the amount of dose reduction and image quality was investigated for pediatric imaging. Absorbed doses of breasts, eyes, thyroid and testes of a series of pediatric phantoms without and with different thickness of bismuth and lead were calculated by Monte Carlo simulation. 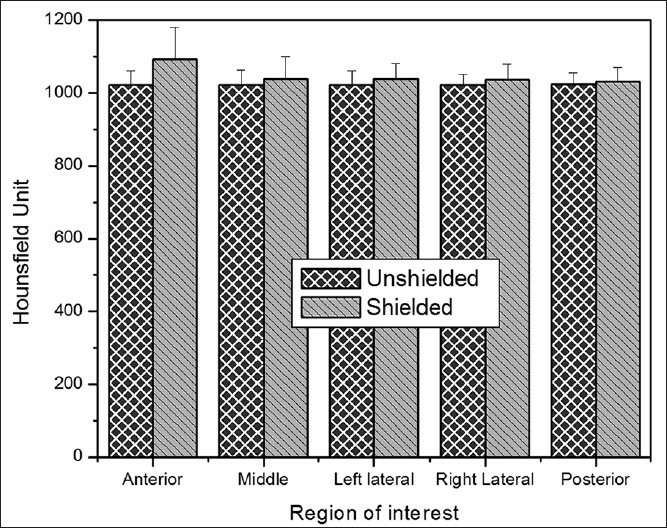 Appropriate thicknesses of shields were chosen based on their weights, X-ray spectrum, and the amount of dose reduction. In addition, the effect of lead shield on image quality of a simple phantom was assessed quantitatively using region of interest (ROI) measurements. Considering the maximum reduction in absorbed doses and X-ray spectrum, using a lead shield with a maximum thickness of 0.4 mm would be appropriate for testes and thyroid and two other organs (which are exposed directly) should be protected with thinner shields. Moreover, the image quality assessment showed that lead was associated with significant increases in both noise and CT attenuation values, especially in the anterior of the phantom. Overall, the results suggested that shielding is a useful optimization tool in CT.
A long-accepted method of dose minimization during radiographic examinations is the use of shielding to protect superficial organs from scatter radiation. Increasing research has gone into the development of shields that can be utilized within the CT scan range. , These shields allow meaningful reduction in dose to superficial organs through the absorption of lower energy dose contributing photons, while not degrading image quality. At general diagnostic imaging energies (60-140 kVp) in soft tissues and bone, a large fraction of the attenuation occurs by Compton scatter rather than by photoelectric absorption, chiefly because of the low atomic number of the tissues. X-ray scatter reduces subject contrast by adding background signals that are not representative of the anatomy. But, in the photoelectric absorption there are no additional nonprimary photons to degrade the image. Therefore, it can be said that image contrast decreases when higher X-ray energies are used in the imaging process. In addition, photons with lower energies are absorbed in the superficial tissues of the body and do not contribute in image construction and just increase received doses especially in sensitive organs such as breast, thyroid, eyes and gonads. Given the importance of dose reduction in CT examinations,  the purpose of this study is to determine the efficiency of shielding the superficial organs as a mean of dose reduction. Its impact on both organ dose and image quality will be compared with those of non-shielded routine CT scanning. In this study, all CT simulations and organ dose calculations were performed using Monte Carlo simulation, which is the most reliable way to obtain accurate values of dose under CT imaging. , For this work, the simulation was operated by Monte Carlo N-Particle eXtended (MCNPX) code in photon mode with a low-energy cutoff of 1 keV. The photon transport model creates electrons but assumes that they travel in the direction of the primary photon and that the electron energy is deposited at the photon interaction site, creating a condition of charged particle equilibrium (CPE). Under conditions of CPE, collision kerma is valid to be equal or very approximate to absorbed dose and is recorded using the type 6 (F6: p) tally of the MCNPX code. The simulations provide dose in MeV g−1 , that is, energy deposition (MeV) per unit mass (g), per emitted particle, therefore some factors are applied to provide absorbed dose in unit of Gy (J kg−1 ). By definition, this tally provides the average dose to entire organ or tissue. In all simulations, 2E9 particles were tracked to obtain statistically meaningful results with relative errors less than or equal to 2% in most organs. A Siemens Somatom Sensation 16 (Siemens Medical Systems, Germany) was simulated within the MCNPX Monte Carlo radiation transport code. The CT scanner had a fan beam originating from the focal spot with a fan beam angle of 52° and a focal spot-to-axis distance of 57 cm. The information about X-ray spectra and scanner's characteristics were provided by the manufacturer. These spectra following passage through different thickness of lead were calculated by compiling a FORTRAN program. A common way to validate the CT scanner model is through comparisons between experimentally measured and simulated computed tomography dose index (CTDI) values. ,,,, For this purpose, a set of CTDI data was simulated for head and body CTDI phantoms with diameters of 16 and 32 cm, respectively, and compared with the measured CTDI values reported by Lee et al., , under the same radiation exposure condition. Moreover, peripheral CTDI values at 12 o'clock were measured with and without shield and were compared with the results of simulation. Therefore, the chamber was positioned at the most anterior chamber location directly above the centre and on the periphery of the phantom at a distance of 1.0 cm from the surface, because this position most closely represents the location of superficial organs in a patient. A 100 mm pencil shaped Radcal® ion chamber model 10 × 5-3 CT (Radcal Corporation, Monrovia, CA), which has an excellent response in diagnostic energy range,  and a Radcal 9015 dosimeter (Radcal Corporation, Monrovia, CA) were used to determine the CTDI values. To perform the comparison, the CTDI phantoms were modeled as a cylinder having a diameter of 16 cm for head and 32 cm for body phantoms, with a length of 15 cm each. The material composition of the CTDI phantoms was simulated as polymethylmethacrylate with a density of 1.19 g cm−3 . The ion chamber was modeled as three 10 cm long concentric cylinders. The innermost cylinder with a diameter of 6.7 mm defined the active air volume. The second cylinder with a diameter of 10.2 mm defined the chamber wall, which is C552 air-equivalent material with a density of 1.76 g cm−3 . The third cylinder with a diameter of 13.7 mm defined a build-up cap, which was modeled as polyacetal plastic with a density of 1.43 g cm−3. The series of stylized computational phantoms developed at the Oak Ridge National Laboratory (ORNL) in the early 1980's have been used extensively in the study of organ doses. These phantoms utilize 3D surface equations to represent both internal organ structure and external body shape. The ORNL series are hermaphrodites (inclusive of both male and female organs and tissues), and include mathematical representations of a newborn, 1-year-old, 5-year-old, 10-year-old, 15-year-old and an adult male. Han et al., were made some revisions to these phantoms such as; developing stylized models (e.g. the head, brain, kidneys, and etc), incorporating new models of some organs such as salivary glands, and using reference values of elemental tissue compositions and mass densities from ICRP Publication 89 and ICRU Report 46. 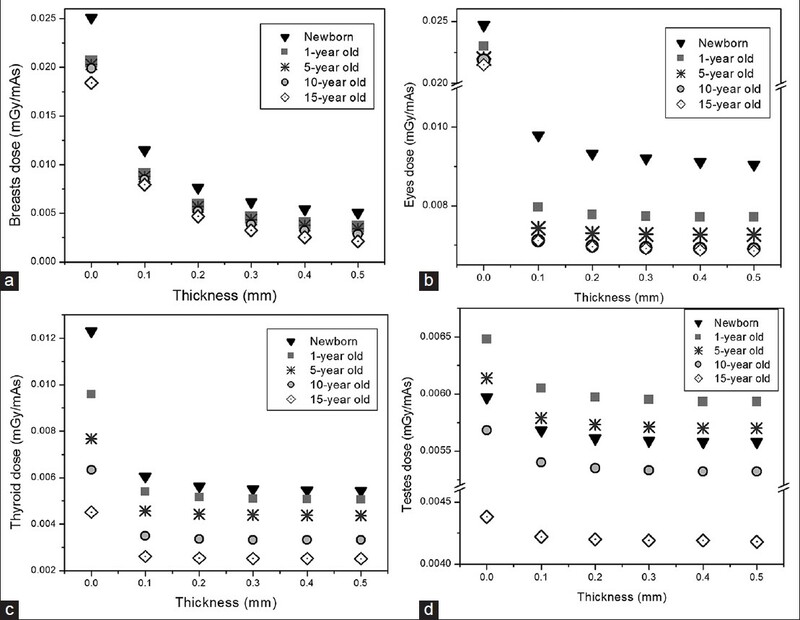 In this study the revised model of ORNL pediatric phantoms (newborn, 1-year, 5-year, 10-year and 15-year olds) were employed. For determination of the amount of dose reduction achievable by shielding the superficial organs, the absorbed doses for organs, which were irradiated directly (breasts in chest scan and eye lenses in head scan) or were mainly exposed by scattered radiation (thyroid in chest scan and testes in abdomen-pelvis scan) were calculated with and without bismuth and lead shields. To compare the absorbed doses, the same parameters were used for both steps. Considering the linear relationship between the mAs and dose,  the results were normalized to mAs. 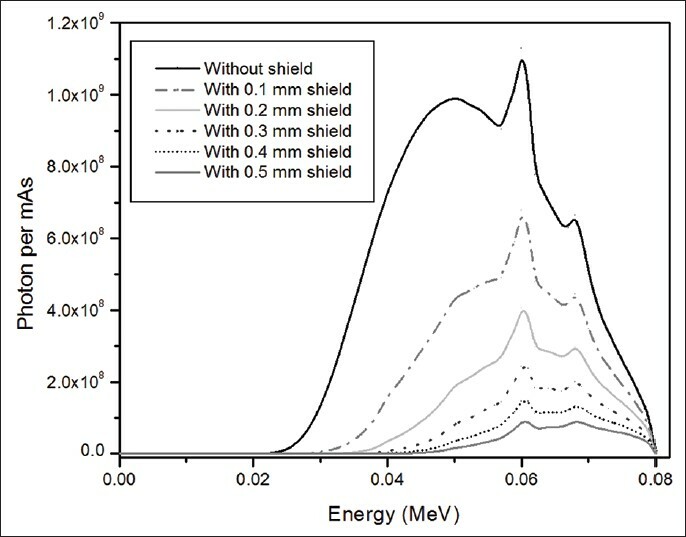 As mentioned, shields should remove the lower energy part of the spectrum, so materials with high attenuation coefficients in diagnostic energy range (lead and bismuth), decrease the amount of required thickness for dose reduction, and therefore reduce the image artifacts. Therefore, lead and bismuth were selected as protective shield to cover the anterior surface of the phantom, so that they did not significantly exceed the width of the anterior surface. Almost 2-cm-thick spacer was used below the shield to decrease streak artifacts observed in the regions adjacent to the surface in contact with the shield. It should be noted that shields should be lightweight, and should not disturb the patient's comfort during a CT examination nor should they interfere with the patient's respiration. Considering the densities of bismuth and lead (9.78 g cm−3 and 11.34 g cm−3 , respectively), the effect of bismuth and lead up to 0.5 mm thickness was investigated in this research. For instance, the maximum weight of lead shield on newborn breasts and thyroid was almost 53 and 37 gram, respectively, while these amounts on 15-year-old phantom were about 461 and 145 gram, separately. To investigate the effects of shield on image quality, a simple calibration phantom with 0.15 mm lead shield over its anterior surface was used [Figure 1]. Two scans were performed without and with lead shield at two different protocols (80 kVp, 192 mAs and 130 kVp, 260 mAs) and the differences between image contrasts of shielded and unshielded images were studied. For a more detailed study, five rectangular ROIs (~ 6 cm 2 ) within a homogenous region of the calibration phantom (a cylinder contains water) were selected to measure both the average Hounsfield units (HU) and the standard deviation (SD) in each region. SD measures can be used as a quantitative measure of noise within CT images and collecting the average HU will check for variations caused by the presence of shields. ROIs were placed in the cylinder (one in anterior, two in lateral, one in middle and one in posterior) on six consecutive slices. ROIs within the inhomogeneous region were precluded from the image quality analysis, as this region cannot be accurately compared between slices. [Figure 2] displays breasts, eyes, thyroid, and testes doses in mGy/mAs for different thickness of lead shield at tube voltages of 80 kVp. From the figure, it is obvious that even a small thickness of shield reduces the received doses significantly. As expected, by increasing the shield thickness, the value of absorbed dose decreases. The values of ED based on ICRP 103 weighting factors in chest examination at tube voltage of 80 kVp for different thicknesses of lead and bismuth shield on breasts are provided in [Table 1]. The same data are available for the other three tube voltages. X-ray spectra following passage through different thickness of lead at tube voltages 80 kVp is illustrated in [Figure 3]. Shielded and unshielded CT images of one slice of calibration phantom at tube voltage of 80 kVp and tube loading of 192 mAs are indicated in [Figure 4]. In this figure, the variations in HUs of consequent image, due to applying lead shield, are observed to some extent, especially in the anterior aspect of the phantom. For a quantitative analysis on the variations of HUs, in addition, [Figure 5] details the results of total 30 ROI measurements made at the cylinder in each of the two experimental techniques. In this figure, error bars indicate SD from the mean. As observed, when shielding is used noises increase throughout, and significant increase is noted in the anterior ROI. In unshielded CT images, the variations in HU (SD), at anterior, middle, left lateral, right lateral and posterior were almost 36, 35, 27, 31 and 30, respectively; while these values in shielded CT images increased to 45, 37, 38, 35 and 30, separately. [Figure 6] displays mean noise recorded in each ROI at tube voltage of 80 kVp and tube loading of 192 mAs. This study quantified the amount of dose reduction using Monte Carlo simulation. The modifications applied to ORNL series caused differences in results of ED estimations, which were more significant in smaller phantoms. But, considering the fact that the effect of discrepancies (in shape, size and location of the organs) on absorbed dose is more substantial in small size phantoms, these disagreements seem reasonable. Results of the dosimetric analysis show that for 5-year-old phantom the amounts of breasts and eyes doses range from 3.55E-03 - 2.03E-02 mGy/mAs and from 7.26E-03-2.2E-02 mGy/mAs, respectively for different thickness of bismuth at tube voltage of 80 kVp. As expected, dose savings is evident for these organs. Moreover, owing to its increased density, larger dose reduction is achieved when lead shield is used. From [Figure 2]c and d, the maximum reductions in thyroid and testes doses of 5-year-old are almost 50% and 9%, respectively. As observed, the amount of dose reduction in thyroid is more than that in testes. This is because in ORNL phantoms, the thyroid center of mass is closer to the scan region. It should be noted that, the amount of dose reduction for organs exposed by scattered radiation, is not as significant as organs exposed directly in the scan range. For all organs (exposed directly or indirectly), there is an exponential relationship between absorbed doses and the thickness of shield, which means that in all the graphs there is a maximum thickness, which causes the maximum reduction in absorbed dose and thicknesses higher than that would not significantly change organ absorbed doses. Moreover, it is observed that lead shield is more effective in dose reduction, so it could be used as a protective shield for superficial organs. Considering [Table 1], shielding the organs exposed directly causes meaningful reduction in ED especially using lead as protection. By increasing the shield thickness, ED decreases. Compared to the calculated values of ED for directly exposed organs, shielding thyroid and testes does not reduce ED significantly. Nevertheless, employing shields on these sensitive organs partly protects them and because shields are not covered in the scan range, probably, they do not affect image quality. As shown, lead shield is more efficient for protecting superficial organs. However, it should be noted that using lead shield causes changes in X-ray spectra, which could affect the image quality. In order to find the effect of different thickness of lead shield on image, the X-ray spectra could be studied. As mentioned earlier, to optimize the X-ray spectra, the higher and lower energy parts of the spectrum should be removed, whilst the characteristic peaks of the spectra (at 60 keV and 68 keV) should not change. In addition, as the thickness of lead increases, more incident photon energies are removed from the spectrum and the abundance of each peak reduces. For instance, the abundance of the peak located at 60 keV without applying shield is 6.68E8, and it reduces to 4.46E8 (33% reduction), 2.99E8 (55% reduction), 2.01E8 (70% reduction), 1.34E8 (80% reduction) and 9.01E7 (86% reduction), for 0.1, 0.2, 0.3, 0.4, and 0.5 mm lead shield, respectively. As observed in the [Figure 3], there is significant reduction in each peak, especially for higher thicknesses, which causes the peak located at 68 keV disappears gradually (this peak is not recognizable for thicknesses higher than 0.2 mm). Thus, considering the role of characteristic peaks in the contrast of the images (due to their photoelectric interaction), the excessive increase in thickness of shield decreases the probability of photoelectric interactions (especially for higher thicknesses) and causes undesirable effects on the image. Therefore, the optimum thickness of shield is the one, which does not change the abundance of characteristic peaks significantly, while it removes the higher and lower energy parts of spectrum as possible. From the spectrum point of view, the lead shield with thicknesses higher than 0.2 mm degrade the image contrast, so for shielding the superficial organs, which are directly exposed to the radiation the maximum lead thickness of 0.2 mm seems be appropriate to remove the lower energies. Although the amount of dose reduction with higher thickness of lead is more considerable, but the destructive effects of thicker layer on the spectrum restrain us to suggest higher thickness of lead as appropriate shields for breasts and eyes tissues. There are no such restrictions for two other organs, which receive dose from scattered radiation. Therefore, for thyroid and testes at tube voltage of 80 and 100 kVp a lead shield with a thickness of 0.4 mm and at tube voltage of 120 and 140 kVp a lead shield with a thickness of 0.5 mm would be proper for significant reduction in dose. Considering that the maximum increase in the image noise is in the anterior aspect of the phantom, in particular, shields should be avoided when a CT is being performed for the evaluation of abnormalities located in the vicinity of the surface over which the shield will be placed. Moreover, radiologist should avoid the use of shields when the absolute CT numbers need to be used for clinical interpretation such as for coronary calcium scoring, renal cyst, or adrenal mass characterization. It was stated that, in abdominal studies, low-contrast areas are severely affected by an increase in image noise, while pelvis, with its greater inherent contrast, is usually not noticeably affected. A much higher level of noise may be tolerated in the high-contrast region of the central lung than in the region of the liver where noise may affect the detection of low-contrast lesions. A low dose CT is unlikely to compromise the required information such as for a pulmonary nodule follow up, evaluation of a bony thorax, and other follow up chest CT studies. Another situation where shields may be beneficial would be for shielding breasts in abdominal CT studies as well as shielding the thyroid gland for chest CT studies. In addition, for children, who are typically scanned at a low radiation dose and have a higher image noise, there is no evidence against applying shield. Further studies into optimization of dose and noise values for various patient types are necessary to identify acceptable thresholds of image quality with minimum radiation doses. In this study, the absorbed doses of breasts, eye lenses, thyroid and testes together with the EDs were estimated for pediatric phantoms undergoing CT examinations without and with different thicknesses of bismuth and lead shields at tube potentials of 80, 100, 120 and 140 kVp. In addition, the effects of using shield on the X-ray spectrum and image quality of a simple phantom were studied. It was observed that applying a small thickness of bismuth or lead shield caused significant reduction in absorbed dose and the amount of dose reduction achievable using lead shields were larger than using bismuth. Assessing the X-ray spectra showed that using a lead shield with thickness of 0.4 mm for tube voltage of 80 kVp is proper for meaningful dose reduction in thyroid and testes and thinner slice of bismuth or lead (with maximum thickness of 0.2 mm) should be applied for shielding breasts and eye lenses. It could be said that, shielding the superficial organs can play an important role in dose optimization during CT scanning. The artifacts and noises produced by the shield are found to be somewhat distracting and they are most evident in the material beneath the shield. However, if superficial organs are not the target of CT imaging, shields cannot interfere with the interpretation of the image and as the organ's shield is excluded from the imaging field, the presence of shield is inconsequential in terms of image quality. Therefore, when it is used in an appropriate setting, bismuth or lead shielding technique is a valid and valuable tool to reduce radiation risk in children. The authors would like to thank Miss Fatemeh Akbari, Mrs Sara Abdollahi, and CT radiologists of Reza Radiotherapy and Oncology Center in Mashhad City for their cooperation in CT imaging of the calibration phantom. Committee on the Biological Effects of lonizing Radiation; National Research Council of the National Academies, Health risks from exposure to low levels of ionizing radiation. BEIR VII, Phase 2.Washington: The National Academies Press; 2005. p. 21-172.
International Commission on Radiological Protection (ICRP), The 2007 recommendations of the international commission on radiological protection. ICRP Publication 2007;21:1-328. United Nation Scientific Committee on the Effects of Atomic Radiation (UNSCEAR), Epidemiological evaluation of radiation-induced cancer. Annex I. UNSCEAR 2000, Report Vol II; 2000. p. 297-450. Hopper KD, King SH, Lobell ME, TenHave TR, Weaver JS. The breast: In-plane X-ray protection during diagnostic thoracic CT-shielding with bismuth radioprotective garments. Radiology 1997;205:853-8. Parker MS, Kelleher NM, Hoots JA, Chung JK, Fatouros PP, Benedict SH. Absorbed radiation dose of the female breast during diagnostic multidetector chest CT and dose reduction with a tungsten-antimony composite breast shield: Preliminary results. Clin Radiol 2008;63:278-88. Bushberg JT, Siebert JA, Leidholdt EM, Boone JM. The essential physics of medical imaging (John JR, Snyder A, DeGeorge T. Eds.) Vol. 1. 2 nd ed. Philadelphia: Lippincott Williams and Wilkins; 2002. Geleijns J, Salvado Artells M, Veldkamp WJ, Lopez Tortosa M, Calzado Cantera A. Quantitative assessment of selective in-plane shielding of tissues in computed tomography through evaluation of absorbed dose and image quality. Eur Radiol 2006;16:2334-40. Halliburton SS, Abbara S, Chen MY, Gentry R, Mahesh M, Raff GL, et al. SCCT guidelines on radiation dose and dose optimization strategies in cardiovascular CT. J Cardiovasc Comput Tomogr 2011;5:198-224. Fricke BL, Donnelly LF, Frush DP, Yoshizumi T, Varchena V, Poe SA, et al. In-plane bismuth breast shields for pediatric CT: Effects on radiation dose and image quality using experimental and clinical data. AJR Am J Roentgenol 2003;180:407-11. Perisinakis K, Raissaki M, Theocharopoulos N, Damilakis J, Gourtsoyiannis N. Reduction of eye lens radiation dose by orbital bismuth shielding in pediatric patients undergoing CT of the head: A Monte Carlo study. Med Phys 2005;32:1024-30. Coursey C, Frush DP, Yoshizumi T, Toncheva G, Nguyen G, Greenberg SB. Pediatric chest MDCT using tube current modulation: Effect on radiation dose with breast shielding. AJR Am J Roentgenol 2008;190:W54-61. Kim S, Frush DP, Yoshizumi TT. Bismuth shielding in CT: Support for use in children. Pediatr Radiol 2010;40:1739-43. Gbelcova L, Nikodemova D, Horvathova M. Dose reduction using bismuth shielding during pediatric CT examinations in Slovakia. Radiat Prot Dosimetry 2011;147:160-3. Paterson A, Frush DP. Dose reduction in pediatric MDCT: General principles. Clin Radiol 2007;62:507-17. The American Association of Physicists in Medicine (AAPM), AAPM position statement on the use of bismuth shielding for the purpose of dose reduction in CT scanning. Available from: http://www.aapm.org/publicgeneral/BismuthShielding.pdf [Last accessed on 15 February 2014]. ICRP, Khong PL, Ringertz H, Donoghue V, Frush D, Rehani M, et al. ICRP publication 121: Radiological protection in paediatric diagnostic and interventional radiology. Ann ICRP 2013;42:1-63. Leswick DA, Hunt MM, Webster ST, Fladeland DA. Thyroid shields versus z-axis automatic tube current modulation for dose reduction at neck CT. Radiology 2008;249:572-80. Wang J, Duan X, Christner JA, Leng S, Yu L, McCollough CH. Radiation dose reduction to the breast in thoracic CT: Comparison of bismuth shielding, organ-based tube current modulation, and use of a globally decreased tube current. Med Phys 2011;38:6084-92. Wang J, Duan X, Christner JA, Leng S, Grant KL, McCollough CH. Bismuth shielding, organ-based tube current modulation, and global reduction of tube current for dose reduction to the eye at head CT. Radiology 2012;262:191-8. Midgley SM, Einsiedel PF, Langenberg F, Lui EH, Heinze SB. Assessment of patient dose and image quality for cardiac CT with breast shields. Radiat Prot Dosimetry 2012;151:463-8. Foley SJ, McEntee MF, Rainford LA. 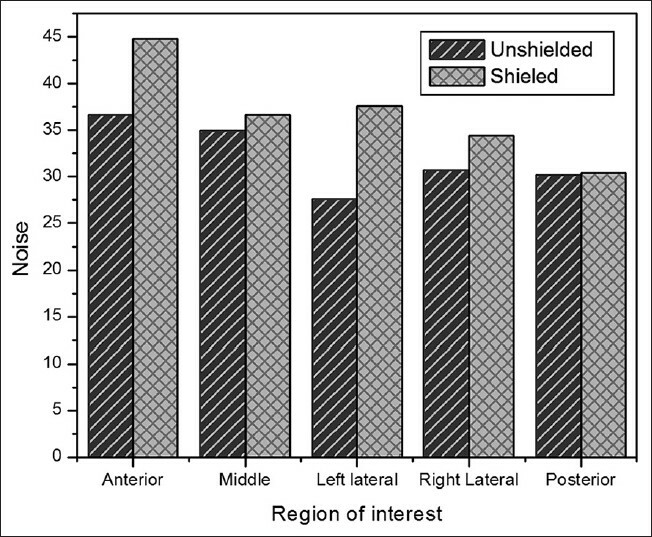 An evaluation of in-plane shields during thoracic CT. Radiat Prot Dosimetry 2013;155:439-50. Akhlaghi P, Miri Hakimabad H, Rafat Motavalli L. An overview of exposure parameters, dose measurements and strategies for dose reduction in pediatric CT examinations. Radioprotection 2014;49:9-15. DeMarco JJ, Cagnon CH, Cody DD, Stevens DM, McCollough CH, O'Daniel J, et al. A Monte Carlo based method to estimate radiation dose from multidetector CT (MDCT): Cylindrical and anthropomorphic phantoms. Phys Med Biol 2005;50:3989-4004. Lee C, Kim KP, Long DJ, Fisher R, Tien C, Simon SL, et al. Organ doses for reference adult male and female undergoing computed tomography estimated by Monte Carlo simulations. Med Phys 2011;38:1196-206. Los Alamos National Laboratory. MCNPX User's Manual, Version 2.4.0. New Mexico; 2002. Khursheed A, Hillier MC, Shrimpton PC, Wall BF. Influence of patient age on normalized effective doses calculated for CT examinations. Br J Radiol 2002;75:819-30. Gu J, Bednarz B, Xu XG, Jiang SB. Assessment of patient organ doses and effective doses using the VIP-MAN adult male phantom for selected cone-beam CT imaging procedures during image guided radiation therapy. Radiat Prot Dosimetry 2008;131:431-43. Gu J, Bednarz B, Caracappa PF, Xu XG. The development, validation and application of a multi-detector CT (MDCT) scanner model for assessing organ doses to the pregnant patient and the fetus using Monte Carlo simulations. Phys Med Biol 2009;54:2699-717. Lee C, Kim KP, Long DJ, Bolch WE. Organ doses for reference pediatric and adolescent patients undergoing computed tomography estimated by Monte Carlo simulation. Med Phys 2012;39:2129-46. Jarry G, DeMarco JJ, Beifuss U, Cagnon CH, McNitt-Gray MF. A Monte Carlo-based method to estimate radiation dose from spiral CT: From phantom testing to patient-specific models. Phys Med Biol 2003;48:2645-63. Staton RJ, Lee C, Lee C, Williams MD, Hintenlang DE, Arreola MM, et al. Organ and effective doses in newborn patients during helical multislice computed tomography examination. Phys Med Biol 2006;51:5151-66. Radcal corporation. Available from: http://www.radcal.com/10×5-3ct [Last accessed on 1 August 2014]. Han EY, Bolch WE, Eckerman KF. Revisions to the ORNL series of adult and pediatric computational phantoms for use with the MIRD schema. Health Phys 2006;90:337-56. United Nation Scientific Committee on the Effects of Atomic Radiation (UNSCEAR), Sources and effects of ionizing radiation, Report to the general assembly with scientific annexes. UNSCEAR 2008, Report Vol I and II, 1-776, 2008. Moore WH, Bonvento M, Olivieri-Fitt R. Comparison of MDCT radiation dose: A phantom study. AJR Am J Roentgenol 2006;187:W498-502. Berrington de Gonzalez A, Mahesh M, Kim KP, Bhargavan M, Lewis R, Mettler F, et al. Projected cancer risks from computed tomographic scans performed in the United States in 2007. Arch Intern Med 2009;169:2071-7. Brinc Z, Vekic B, Hebrang A, Anic P. Efficiency of breast shielding during CT of the head. Eur Radiol 2003;13:2436-40. Hohl C, Mahnken AH, Klotz E, Das M, Stargardt A, Mühlenbruch G, et al. Radiation dose reduction to the male gonads during MDCT: The effectiveness of a lead shield. AJR Am J Roentgenol 2005;184:128-30. Ngaile JE, Uiso CB, Msaki P, Kazema R. Use of lead shields for radiation protection of superficial organs in patients undergoing head CT examinations. Radiat Prot Dosimetry 2008;130:490-8. McLaughlin DJ, Mooney RB. Dose reduction to radiosensitive tissues in CT. Do commercially available shields meet the users' needs? Clin Radiol 2004;59:446-50. Vollmar SV, Kalender WA. Reduction of dose to the female breast in thoracic CT: A comparison of standard-protocol, bismuth-shielded, partial and tube-current-modulated CT examinations. Eur Radiol 2008;18:1674-82. Kalra MK, Dang P, Singh S, Saini S, Shepard JA. In-plane shielding for CT: Effect of off-centering, automatic exposure control and shield to surface distance. Korean J Radiol 2009;10:156-63. Hurwitz LM, Yoshizumi TT, Goodman PC, Nelson RC, Toncheva G, Nguyen GB, et al. Radiation dose savings for adult pulmonary embolus 64-MDCT using bismuth breast shields, lower peak kilovoltage, and automatic tube current modulation. AJR Am J Roentgenol 2009;192:244-53. McCollough CH, Bruesewitz MR, Kofler JM Jr. CT dose reduction and dose management tools: Overview of available options. Radiographics 2006;26:503-12. Kalra MK, Maher MM, Toth TL, Hamberg LM, Blake MA, Shepard J, et al. Strategies for CT radiation dose optimization. Radiology 2004;230:619-28.